Daniel Agger left Liverpool in 2014 after eight years of loyal service, having fallen down Brendan Rodgers’ central defensive pecking order. Comments were made at the time from the loyal Dane, but none quite as honest as these ones publicised in his lengthy interview reported here in the Guardian. Agger believes their relationship broke down on the day of the game against Southampton on 21 September 2013 when Agger played despite an injury and was at fault for Southampton’s goal. “After the game he did not speak to me. Something went wrong. I was the first to admit that it was my fault. I apologised but as one of the physios said there was no need to apologise as the other 50 times that I had said that I was ready and played, even if I wasn’t fit, it had been fine. In those games one couldn’t see it but then there was this game, where I could not keep track [of my player]. 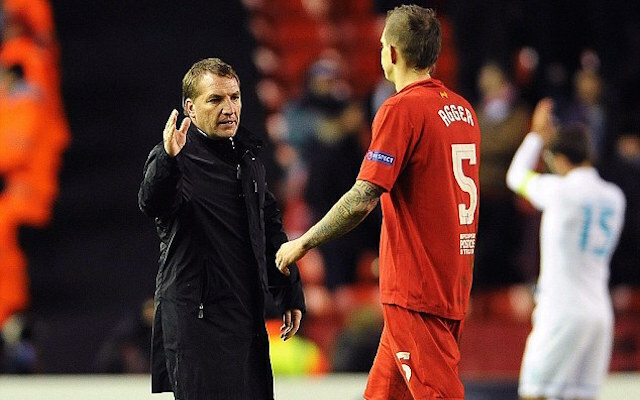 Things came to a head again when, according to Agger, there was a heated conversation between him and Rodgers at half-time against Swansea City on 23 February 2014. Rodgers was criticising the two central defenders, Skrtel and Agger, for letting Wilfried Bony have too much of the ball.